It’s a Durga Puja with a difference. 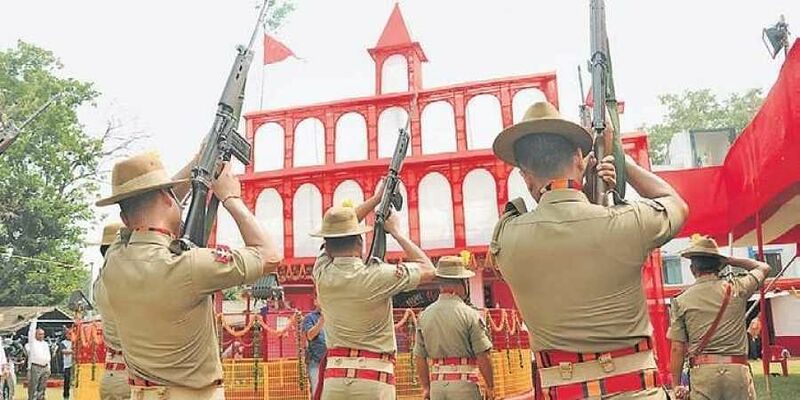 Instead of idols of the Goddess Durga, the the Gorkha Wahini of Jharkhand Armed Police (JAP) worships their weapons during the nine-day festival. RANCHI: It’s a Durga Puja with a difference. Instead of idols of the Goddess Durga, the Gorkha Wahini of Jharkhand Armed Police (JAP) worships their weapons during the nine-day festival. 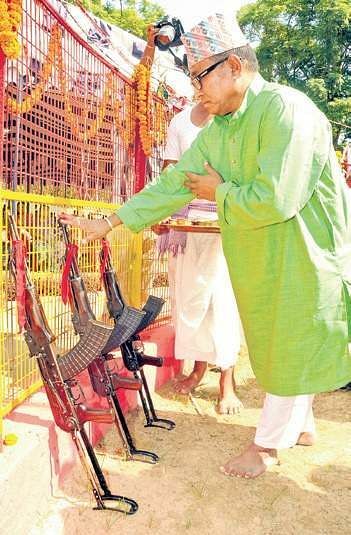 Weapons like AK-47, INSAS rifles, pistols, mortar, carbines, rocket launchers and grenades are placed on the stage, decorated with flowers and worshipped. It is believed that the weapons signify ‘Shakti’, a form of Durga, who has arms in all her ten hands. But the Chakra, Trishul (Trident), Gada (mace), Bow and Arrow, Scimitar and Shield wielded by the Goddess are replaced by modern weapons. These weapons are not only displayed, but fired regularly during all nine days when the Puja is performed. The main puja is performed on day nine, or ‘Navmi,’ when several goats are sacrificed using those weapons. “It is believed that Maa Durga gets happy with the deafening sound of bullet,” said head priest Shahdeo Updhyaya, also a JAP personnel. Part of the reason could also be that idol worship is considered to be a bad omen among the Gorkha Wahini. According to local legend, a commandant once tried to change the tradition, but the idol being brought for puja met with an accident leaving several people died. The whole company had to face problems and several people, including the Commandant, fell ill after an epidemic broke out in the camp. The weapon worship started in 1880 when Gorkha Wahini was formed by the British, named then as New Reserve Police Force. The tradition continued after it was renamed as Bihar Military Police in 1947 and later as Jharkhand Armed Police in 2002.